In April 2018, crude oil exports from port district of Houston-Galveston surpassed crude oil imports by 15,000 barrels per day (b/d), and in May 2018, the difference between crude oil exports and imports increased substantially to 470,000 b/d. Source: U.S. Energy Information Administration and U.S. Census Bureau Note: Not included in the map are the Houston Intercontinental Airport and the Sugar Land Regional Airport, which are also ports within the Houston-Galveston port district. The U.S. port district of Houston-Galveston in Texas recently began exporting more crude oil than it imported for the first time on record. Crude oil exports from the Houston-Galveston port district have increased since the restrictions on U.S. crude oil exports were lifted at the end of 2015. In April 2018, crude oil exports from Houston-Galveston surpassed crude oil imports by 15,000 barrels per day (b/d). In May 2018, the difference between crude oil exports and imports increased substantially to 470,000 b/d. Total U.S. crude oil exports rose to a record high of 2 million b/d in May. On average since mid-2017, the U.S. port district of Houston-Galveston has accounted for slightly more than half of the crude oil exported from the United States, and the share increased to a record 70 per cent in May. A port district is a geographic region defined by U.S. Customs and encompasses several individual U.S. ports of entry. The Houston-Galveston port district includes the port of Houston as well as several other ports along the Texas Gulf Coast, from Galveston to Corpus Christi. Ongoing efforts to expand crude oil export infrastructure at the ports of Houston and Corpus Christi have allowed for increased export flows. The only other port district that has seen significant crude oil export volumes recently is the U.S. port district of Port Arthur, which includes the Texas ports of Port Arthur, Sabine, Beaumont, and Orange. This district has on average accounted for close to a quarter of all U.S. crude oil exports since mid-2017. Despite infrastructure improvements, however, crude oil export capacity is still limited on the U.S. Gulf Coast, because most ports are unable to load larger crude oil vessels. Crude oil is imported into many locations in the United States, but most of the oil goes through the U.S. Midwest or the U.S. Gulf Coast. 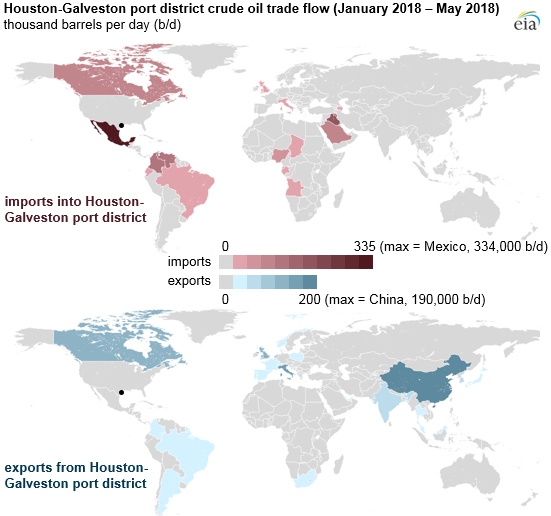 The U.S. port district of Houston-Galveston accounted for 12 per cent of total U.S. crude oil imports as of May, second only to the U.S. port district of Chicago, Illinois, at 19 per cent. Source: U.S. Energy Information Administration and U.S. Census Bureau. Crude oil that is imported into the Houston-Galveston port district mainly comes from Mexico, South America, and the Middle East. These regions generally produce and export heavier grades of crude oil to the United States, and refineries in U.S. Gulf Coast are better configured to process heavier crude oil. The types of crude oil that are exported tend to be the lighter grades that are produced in the United States and shipped mainly to Europe and Asia. Most crude oil exports from the Houston-Galveston port district in 2018 have gone to China, Italy, Canada, and the United Kingdom. Canada is one of only a few countries that have both imported crude oil from and exported crude oil to that port district in 2018. So far in 2018, the Houston-Galveston port district has exported about 30,000 b/d more crude oil on average to Canada than it imported from the country. Larger spot price spreads that developed between the global crude oil price benchmark of Brent and crude oil priced in Houston, Texas, in April and May could have contributed to more crude oil being exported. The price of Brent crude oil averaged $2.69/b and $2.52/b higher than Magellan East Houston crude oil in April and May, respectively. PreviousNEB Market Snapshot: What is pipeline apportionment?